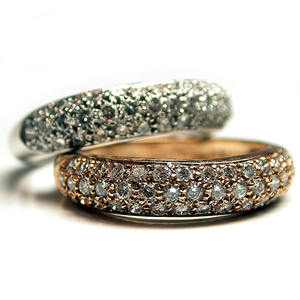 These pretty 18 karat rose and white gold rings dazzle with pave-set brilliant cut diamonds. The F/G color, SI clarity diamonds total .85 carat (each). These pretty rings taper from 5 millimeters to 3 millimeters at the bottom.